Mid 60s this morning when I walked out of the house to go to work! No wind and a little overcast. How refreshing! Should hit the mid 80s today and lower 90s tomorrow. Rain in the forecast for Wednesday and Thursday with Thursday’s high in the upper 70s! Temps look like lower 90s for Tuesday and Wednesday. But, definitely a cool down from Thursday through the weekend, and continuing into next week. We continue to see spastic generation patterns. Off in the a.m. during the week and coming on somewhere from noon to 2:00 p.m. On for several hours, then off again until the next day. However, on the weekend!!!! they are running a low or full one unit all weekend. Jim on the water last Wednesday with Mike from Kansas. Good day for Mike on the P&P midge, B-bug, and white worm. They stayed high as the water did not come on until late in the afternoon that day. David fished with Darrell and caught fish on the white grub. Wednesday and Thursday, Stan took George out for half a day each day. She has been fishing with Stan for ten years. Not a great day, but good day for George on the P&P midge and stripping the holographic green crackleback. Mike, from Texas, spent most of the day on the water with Carolyn. Fairly slow start early, but things picked up as the day went on, and Mike caught fish on an egg pattern, San Juan worm, and best of all a 17 inch rainbow on the big ugly. Jim and Darrell both out on Friday. Jim took Bill and Jerry from California out for half a day. Good day for these guys on the white grub. Darrell had Ed from Kansas out again. Their pattern was the brown San Juan worm. 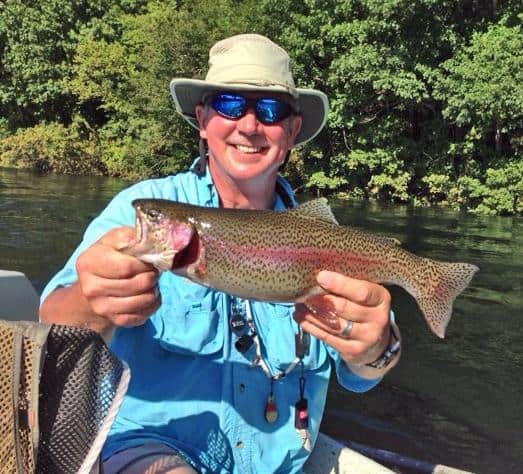 This entry was posted on Monday, September 8th, 2014 at 12:05 pm	and is filed under Fishing Reports. You can follow any responses to this entry through the RSS 2.0 feed. You can leave a response, or trackback from your own site.